This look at electric horizontal grinders is not intended to endorse or promote any particular product or manufacturer. Attempts were made to include input from all known North American manufacturers of horizontal grinders. Increasing government regulations – particularly federal emission standards – and a lower operating cost compared to diesel powered machines, are driving demand for electric horizontal grinders, manufacturers say. “We are definitely seeing an increase in the popularity in electric machines, and most of that is driven by cost of operation and cost of ownership,” said Jay Van Roekel, strategic business unit manager at Vermeer Corp., of Pella, Iowa. Jason Morey, sales and marketing manager for Bandit Industries Inc., Remus, Mich., said he has seen a consistent demand for electric grinders in recent years. Machines that are not Tier 4 Final must be in production by December 31 in order to be sold in the U.S.
Manufacturers say electric horizontal grinders provide myriad benefits in stationary applications, but most see no potential for making the machines mobile for off-site work using portable generators in the near future. Hauling an electric generator that can power a grinder, they say, defeats the purpose of eliminating a diesel engine on the machine. 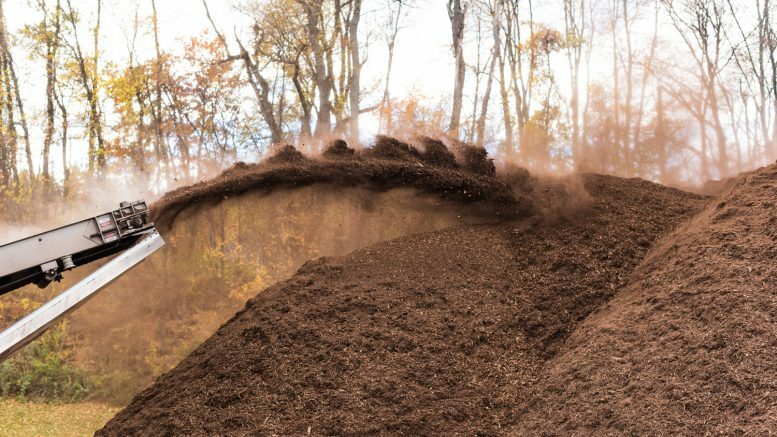 Electric grinding equipment, according to Art de St. Aubin, president and CEO of Rotochopper Inc., of St, Martin, Minn., is one of the most dramatic and under-utilized means of minimizing costs of mulch production. According to Paul Clark, electric systems engineer at Peterson Pacific Corp., Eugene, Ore., the relative consistent cost of electricity, compared to fluctuating diesel fuel prices, is a main reason why operators consider electric grinders. “In some cases overseas, where diesel costs are really high, they will only consider electric,” Clark said. Grinder manufacturers generally agree that an electric horizontal is likely to provide a lower production cost per ton than a diesel powered machine if you process material in a fixed location and have access to a three-phase power supply. Either electric or diesel grinders and shredders will do the same job on the material, said Todd Dunderdale, senior area sales manager for Komptech Americas, Westminster, Colo. Following is a look at what manufacturers of horizontal grinders for organic materials processing are saying about the electric option. Tim Wenger, vice president of CW Mill Equipment Co., Sabetha, Kan., said electric grinders are ideal for stationery grinding operations. Originally, Van Roekel said, the market for electric machines was driven by efficiency of operation compared to diesel engines. “Over time, we’re seeing regulations pushing more people toward electric power,” he said. Operating a stationery electric grinder offers convenience and efficiency of maintenance, said John Snodgrass, who is in technical sales at West Salem Machinery, Salem, Ore.
Clark said the additional up-front costs to power a new site could range between $150,000 and $200,000, including costs from the local power utility and an electrical contractor. “If you already have power, it’s relatively inexpensive,” Clark said. Van Roekel said depending on hours of operation and maintenance practices, the operating costs of an electric grinder can be about half the costs of running a diesel machine. Electric grinders offer cost savings associated with routine maintenance as well, de St. Aubin said. “Besides savings on diesel fuel, electric grinders eliminate the costs and downtime associated with maintaining a diesel engine, radiator and clutch, including oil and filter replacement, coolant exchange, air filter replacement and clutch fluid and filter replacement where applicable,” he said. According to Snodgrass, the absence of road hauling equipment also reduces the cost of an electric machine. Kollin Moore, electrical engineer with Morbark LLC, Winn, Mich., cautions, however, that the resale market for electric horizontals could be a limited compared to diesel machines. Moore said electric motors typically last up to two or three times longer than diesel engines. Moore cited the following advantages of an electric horizontal grinder compared to a diesel powered machine: Cleaner, more efficient power source with no emission regulations to meet, quieter operation, less maintenance, less expensive to operate, lower capital cost and less chance of catastrophic fire. Comparing the relative grinding power of comparably sized diesel and electric motors is one area where some manufacturers disagree. Most sources interviewed suggested that electric motors can provide more power directly to the rotor than a comparably sized diesel. Pat Crawford, vice president of products for Diamond Z, Caldwell, Idaho, disagreed. Clark, however, said electric motors can deliver more power than their diesel counterparts. Griffing said electric grinders offer a better torque curve than diesel powered machines. “I would say comparing a 600 horsepower CAT diesel engine with a 600 horse electric motor, the electric will increase your power at the rotor by a minimum of 25 percent,” Griffing said. Dunderdale said the available grinding power is the most important question to consider. Engine comparisons aside, Griffing said because stationary electric grinders aren’t governed by Department of Transportation specifications like mobile units, the machines can be configured to meet the needs of an operation. That means they can have larger hoppers and longer discharge conveyors. “Electric driven grinders can be used anywhere there is enough power to drve them,” Griffing said. Manufacturers generally said minimum requirements generally include three-phase power with a minimum of 460-480 volts at 60 hertz. Having adequate electrical power at the installation site is important, and not always simple to achieve, some manufacturers noted. Required amperage, Crawford said depends in the horsepower of the motor. Clark said Peterson’s machines required between 1,000 and 2,500 amps depending on the size the motor. Wenger said power drops can damage motors. Clark said Peterson recently had a customer who was experiencing low voltage. Having access to sufficient power, Spreadbury said, is not always a given. Tightened regulations in engine air emissions will increase the cost of diesel machines, making electric motors more attractive for the appropriate applications, manufacturers agree. “Due to emissions standards becoming more strict, electric drive is becoming more popular,” Griffing said. Peterson also expects stronger interest in electric machines. “With onset of Tier 4 and the significant price increases that it is going to entail, we are going to see more and more applications where, of the machine does not have to move, we’re going to be quoting more electric machines,” Spreadbury said. Wenger said sales and inquiries for electric grinders increased a few years ago when diesel prices bumped upward. According to Moore, Morbark has seen the demand for electric grinders slowly increasing, especially during times when the price of oil has been elevated. New technology has made many electric products more mobile. Horizontal grinders are unlikely to be one of them, manufacturers agree. That, Wenger said, is one of the few downsides of an electric grinder. De St. Aubin said that portable configurations using quick-connects are available, but power availability is essential. “The site must have adequate three phase power available,” he said. Griffing said quick-connects at adequately powered sites allows an operator to move an electric to two or three different locations. “It works great, but you need to have soft starts at each of the facilities,” he said. Wenger added that one customer has two locations powered up on his site so he can move an electric tub grinder back and forth. Snodgrass noted a similar situation. “I have seen yards where they have a semi portable situation,” he said. “They will have a crude pad and the ability to get power to it so they can process X amount of tons and when they are finished they can pack it up. The control panel is a part of the unit, so they can pack it up and move it to another part of the yard. It isn’t something that you would run for a week – you probably would run it for a year at a site. But generally, if you are dragging a generator around you are defeating the purpose. Wenger said converting an existing diesel powered horizontal grinder to electric is simple. Griffing said diesel-to-electric conversions are becoming increasingly popular. Before making the decision to install a horizontal grinder, you need to know your local codes, Van Roekel said. Moore noted that local laws may have restrictions relative to operating hours and start up times. Before purchasing an electric grinder, Wenger said, be sure to do your homework. Be the first to comment on "A look at electric horizontal grinders"